The Cessna Citation Sovereign (Model 680) is an American 3,200 nmi (5,900 km) range business jet developed by Cessna, part of the Cessna Citation family. Announced at the 1998 NBAA convention, it made its maiden flight in February 2002, certification was awarded on June 2, 2004, and deliveries began in late September. The improved Sovereign+ was announced at the October 2012 NBAA for a first flight in April 2012 and deliveries in December, with winglets, improved engines and flight deck. The Citation Excel fuselage was stretched and joined with a large, clean-sheet 16.3 °, 516 sq ft (47.9 m2) wing and two 5,900 lbf (26 kN) PW300 engines for a 30,800 lb (14,000 kg) MTOW. 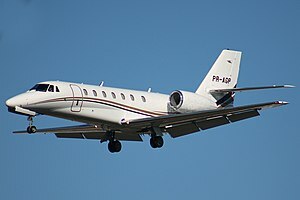 In the late 1990s, Cessna wanted to fill a gap in its midsize line-up as demand for its Cessna Citation III/VI/VII waned, with greater cabin comfort, performance and utility than its concurrence but with Citation reliability, a high aerodynamic lift wing for runway performance, and near transcontinental flight range to compete with the Hawker 800, a thrust-to-weight ratio to rival the climb performance of the Learjet 60. It was announced at the 1998 NBAA convention, it made its maiden flight in February 2002 and deliveries began in late September 2004. FAA certification was awarded on June 2, 2004. EASA certification came on 31 March 2005. The improved Sovereign+ was announced at the October 2012 NBAA, it rolled out in early March 2013, first flew in April, and began deliveries on December 23 after certification, at a time when the Sovereign fleet reached 349 and had flew 802,000 hours. Winglets were for more range of 150 to 3,000 nmi (280 to 5,560 km), new PW306D engines with autothrottles provides 5,852 lbf (26.03 kN) of thrust for a 458 kn (848 km/h) top speed and a FL450 direct climb, full fuel payload was increased and the Garmin G5000 replaces the avionics. The Citation Excel fuselage was stretched for a 6.6 ft (2.0 m) longer cabin and joined with a large, clean-sheet 515.9 sq ft (47.93 m2) wing with large trailing edge flaps for runway performance, with a relatively high critical Mach number for efficient 445 kn (824 km/h) TAS cruise. It is powered by 5,770 lbf (25.7 kN) Pratt & Whitney Canada PW306C engines, derated from the Gulfstream G200 or Do 328JET, and uses Honeywell Primus Epic glass cockpit avionics with four LCD screens. The cabin maintains a 7,200 ft (2,200 m) altitude with the 9.3 psi (0.64 bar) pressurization and typically comprise double-club seating for eight, two more than the Gulfstream G150, plus a side facing seat, and can accommodate up to 11. It can carry a full fuel payload of 1,000–1,200 lb (450–540 kg) and can fly 2,840 nmi (5,260 km) at a block speed of 406 kn (752 km/h). It can takeoff in 3,640 ft (1,110 m) and climb to FL410 in 19 min and to FL430 in 26 min. It travels 400 nmi (740 km) in the first hour while burning 2,000 lb (910 kg) at FL410, 420 nmi (780 km) the second hour with 1,550 and 1,400 lb (700 and 640 kg) the third hour at FL430. At a weight of 10,505 kg (23,160 lb) and ISA -5°C, it burns 653 kg (1,440 lb) per hour at Mach 0.778 / 441 kn (817 km/h) or 454 kg (1,001 lb)/h at a long-range cruise speed of Mach 0.634 / 360 kn (670 km/h). Basic maintenance is due at 400 hr or every 12 months and dispatch reliability is over 99%. The Learjet 60 cruises faster with less fuel but its cabin is smaller, the slower Hawker 900XP has 100 mi (160 km) less range and a wider but shorter cabin like the Gulfstream G150 which has more range, speed and fuel economy. In 2017, the Sovereign were sold from $5 to $9 million for early 2004 models to 2013 aircraft. In 2013, two-thirds of the fleet was in the U.S. with NetJets as its largest operator with 44. In Americas, 20 were in Brazil, 12 in Canada and eight in Mexico. In Europe, ten were in U.K., nine in Germany, three in Prague and in Austria, two in the Netherlands. In Africa, eight were in Egypt, four in South Africa and one in Morocco. In Asia, eight were in Turkey, five in China, three in Australia and one in Jordan. Most corporate operators fly the aircraft 350- to 400-hr. per year, less for individuals while fractional ownership and air charter aircraft may be used 1,200 hr. per year. ^ a b "Cessna receives FAA certification, begins deliveries of new Citation Sovereign+" (Press release). Cessna. Dec 23, 2013. ^ "Business Jets Specification and Performance Data" (PDF). Business & Commercial Aviation. Aviation Week. May 2015. ^ a b c d Fred George (Sep 22, 2017). "Citation Sovereign: Largest Cabin, Best Runway Performance In Class". Business & Commercial Aviation. Aviation Week Network. ^ a b "Flight test: Cessna Citation Soverign [sic] - Mid-size marvel". Flight International. 5 Oct 2004. ^ "Type Certificate Data Sheet T00012WI Textron Aviation Inc. 680/680A" (PDF). Federal Aviation Administration. March 6, 2017. ^ "Type Certificate Data Sheet No. EASA.IM.A.033 for Cessna 680 and 680A" (PDF). European Aviation Safety Agency. 10 Feb 2016. ^ Fred George (Sep 1, 2013). "Citation Sovereign". Business & Commercial Aviation. One of the most capable Citations yet built. Fred George (September 2003). "Pilot Report: Cessna Citation Sovereign". Business & Commercial Aviation. The largest Citation yet built offers good range and light jet airport performance. Matt Thurber (October 1, 2013). "Pilot Report: Cessna's New Citation Sovereign". AIN. Ken Webster (January 11, 2018). "Citation Sovereign Operating Costs". CapitalJet. This page was last edited on 9 April 2019, at 18:54 (UTC).